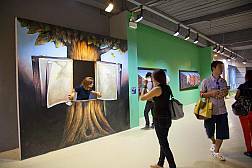 If you are a fan of arts, then you must visit the Art in Paradise Exhibition in Pattaya. This quality Pattaya art museum really is something different from the normal touristy attractions. 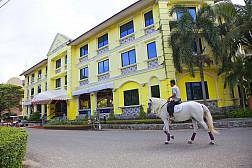 Horseshoe Point is a riding club situated in the countryside that surrounds Pattaya, and is a great day's fun for holidaymakers. 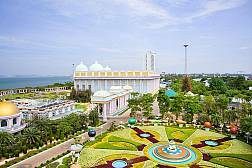 Nong Nooch Gardens in Pattaya is one of the most popular Pattaya attractions for many reasons. Merging together a zoo type environment with gardens and a theme park, you simply can't go wrong on your Pattaya holiday. Oasis Spa Pattaya is the ideal place if you are wishing to relax and rejuvenate. With a great mix of spa treatments in an ultra-relaxing environment, you really need to visit this spa when you are in Pattaya. 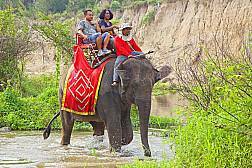 Thailand and elephants are synonymous with each other. 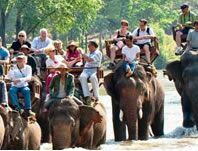 Visitors to Thailand always make a point of seeing the elephants at first hand. 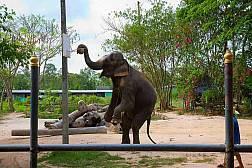 Pattaya Elephant Village is the place to see these majestic beasts at their wonderful best. 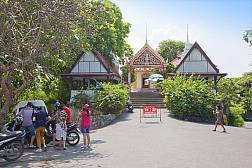 Khao Kheow Open Zoo in Pattaya is situated close to Sriracha and is known as one of the best zoos in Thailand. 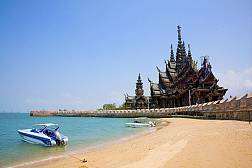 If you are on holiday with family and friends, this popular Pattaya attraction is a must see! 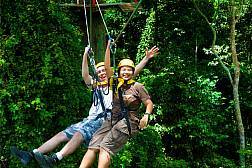 Glide through the beautiful jungle canopy with the Flight of the Gibbon experience in Pattaya. 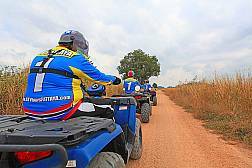 High-octane activity seekers or just those who like something different and adventurous will have an amazing day. Alangkarn Theater in Pattaya is the only place to visit if you want to enjoy an extravagant show that details Thailand's rich and illustrious history. 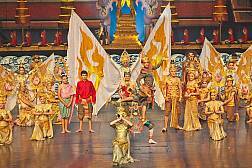 If you like shows and love Thai culture, you cannot afford to miss the Alangkarn Theater show. 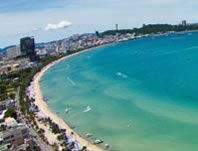 With its fantastic beaches and excellent weather, it is little wonder that many who come to Pattaya are looking to take part in some water sports. 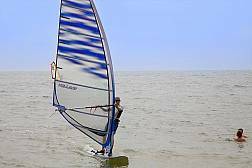 There are few better places to do it than at Amara Windsurfing Club! If you always wanted to meet the world's famous people all under one roof, this might be the only chance you ever get. Waxwork museums are great fun and the perfect chance to have your photo taken with Barack Obama. Louis Tussaud’s Waxworks in Pattaya is a great family experience. Go around the world in an hour or two at Mini Siam in Pattaya. This miniature world of models is perfectly scaled and allows you to see wonders of the world such as the Pyramids. This is a great day of fun for the family. 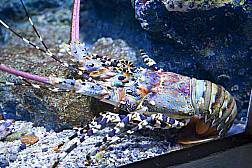 Pattaya Underwater World is one of the most popular and famous Pattaya attractions. Perfect for the family, the aquarium has more species of fish than you can possibly imagine. High Octane adrenalin junkies will love Pattaya Speedway Karts. Imagine blasting around the purpose built track and battling it out with family and friends to see who is best! 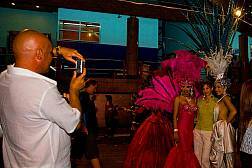 This is an amazing hour or two's fun when on your Pattaya holiday. Make a splash at Pattaya Water Park! You know you want to... and the kids most definitely do. 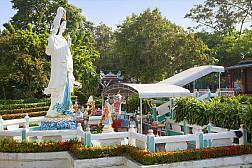 For a day's clean and friendly family fun, Pattaya Water Park is a great choice. 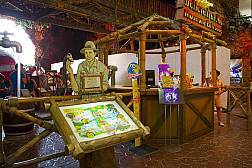 Changthai Thappraya Safari and Adventure Park is yet another reason why Pattaya has become a popular family holiday destination. Take an afternoon out to visit this interesting theme park... the kids will love you for it! 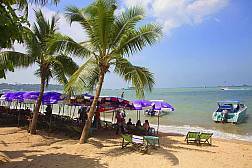 Bang Sean is a very laid back coastal area approximately an hour drive from Pattaya. 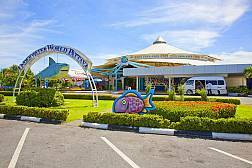 It has a nice yet busy beach where there is always something going on and a great Aquarium that is much better than Pattaya Underwater World, and much less expensive! Laem Chabang International Country Club is one of the region's finest golf clubs - a championship course in its own right and the perfect place for a perfect round of golf. St. Andrews 2000, as you can probably tell by the name, was an ode to the oldest golf course in the world. Sharing some interesting undulating fairways and difficult greens, this course is a challenge for players of every level and age. 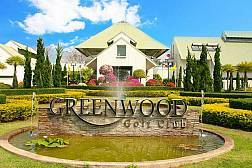 Greenwood Golf Club is well known for its great value for money prices. 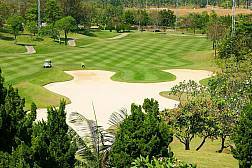 If you are looking for some of the best value for money golf in Thailand, then look no further! 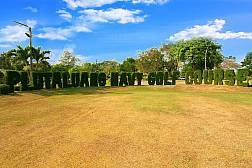 Eastern Star Golf Course is located in Bang Chang, on the way to Rayong. 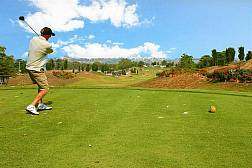 This very affordable golf course is perfect with high handicappers and those who enjoy a great value for money round of golf. 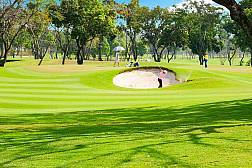 Crystal Bay GC is a quality Pattaya golf course with 27 holes, which is also a challenge for both high and low handicappers who can battle their way around this very enjoyable tree-lined course. 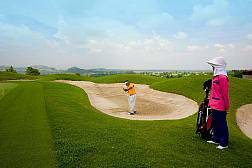 Burapha Golf Club is one of the most popular golf courses in Pattaya, and with 36 holes at your disposal, this is a golf lovers' paradise. Bangpra International Golf Club really is set in a beautiful jungle environment with some of the most stunning wildlife you can imagine. Trees line every part of this challenging yet enjoyable course. 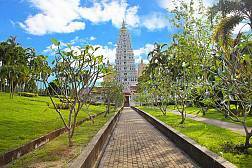 The Sanctuary of Truth is one of Pattaya's most intriguing attractions. Not really known for being a temple or religious building, and more known for its aesthetically pleasing design. Either way, this is simply a must visit attraction for all Pattaya visitors. 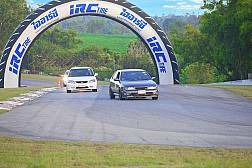 If you are seeking out a quality Pattaya adventure activity, Bira Circuit Racing in Pattaya is for those who want to enjoy a bit of racing. 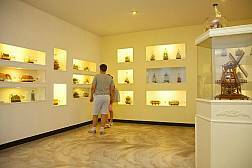 If you are looking for art in Pattaya, the Pattaya Bottle Art Museum is a place that you will love. 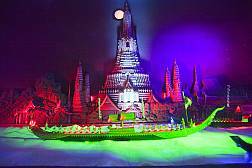 Using bottle to create artistic masterpieces, this is the most unique art museum in Pattaya. The Chonburi Buffalo Race is an interesting event, and it's exactly how it sounds. 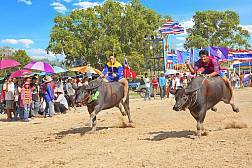 Buffalo are an intricate part of rural Thai life and this festival at Chonburi is an ode to this helpful beast. 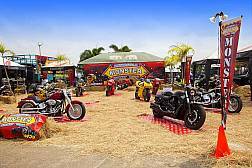 The Burapa Bike Show is something of an institution in the Pattaya region. Bikes of all sizes, colors and types parade around the venue showing off. There are also live rock shows during the night, and you can even camp over if you like. Casa Pascal Restaurant in Pattaya is well known in the area for its fine dining and excellent French cuisine. 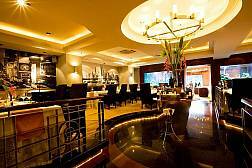 If you are seeking a classy eatery for a great romantic meal, this is the place for you. If you are interested in getting an insight into Muay Thai Boxing in Pattaya, the Chor Nateethong Thai Boxing Club in Pattaya is the place to go. Learn the county's oldest martial art in the hands of experts. 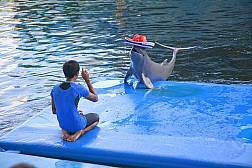 The Pattaya Dolphin World Show is the only place in Pattaya that you can see the majestic dolphin at first hand. The show is ideal for families and wildlife lovers and is a great family holiday experience. Take a beautiful tour around the stunning Silverlake Vineyard, which is located a 15-minute drive from Jomtien and not too far from Bang Sare. The vineyard is not just home to grape vines, but also has a fine restaurant and scenic countryside. Koh Loy Tropical Island might not be the biggest island in Pattaya, but it is very beautiful. Take a day out of your Pattaya schedule to enjoy the exotic Koh Loy. 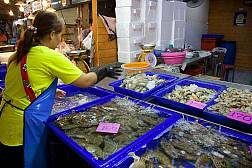 If you want to purchase some of freshest seafood in Thailand, an excursion to Naklua Fish Market is a must. Located next to the sea, the hustle and bustle of the market is vibrant and colorful. 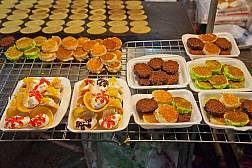 If you are seeking out the best market in Pattaya, many would say the weekend night market at Thepprasit Road. For the best prices on footwear and clothing, this is the market to visit. It can get very busy though. Pattaya Floating market is like an institution in these parts. 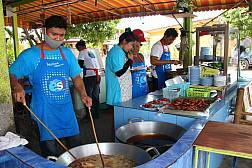 The purpose-built market sits on a cool lake and is a great place to take the family to buy some excellent local handicrafts. 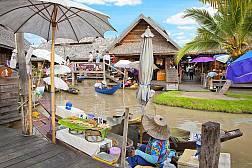 If you visit Pattaya, you have to make the pilgrimage to Pattaya Floating Market. 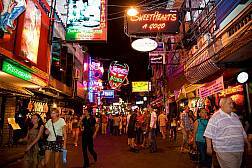 Pattaya Walking Street might very well be the most famous street in Thailand. With hundreds of bars and restaurants and a vibrant atmosphere that has to be experienced to be believed, there is not another street in the world like this one! 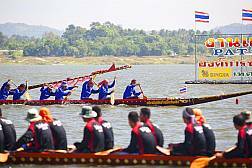 There are a few small scale Pattaya longboat racing events throughout the year, so if you're a fan of fast and colorful longboats, please read this article. If you are into high-octane adventure activities in Pattaya, Canopy Adventures Cable Ride in Pattaya will give you a real buzz. 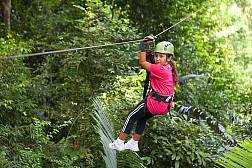 Glide through the jungle canopy in the hands of experts and experience the thrill of a lifetime. 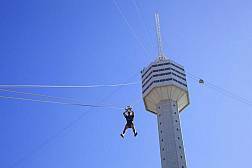 Bungy Jump in Pattaya is one of those excellent Pattaya extreme activities that many travelers really want to try in this day and age. If you are up for a spot of Bungee jumping, this is the place to do it! Get away from it all at Koh Larn in the Gulf of Siam. This small yet beautiful island is just a short boat ride away from Pattaya and the easiest way to see one of Thailand's famous tropical islands. 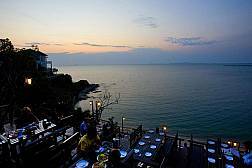 Rimpa Lapin is known as one of the best restaurants in Pattaya, situated ocean-side just a 10-minute drive from Jomtiem. Manhattans Restaurant in Pattaya is widely known as one of he best restaurants in Pattaya. If you want to enjoy that special romantic meal or just to taste some of the best food in Pattaya, Manhattans is the first choice. 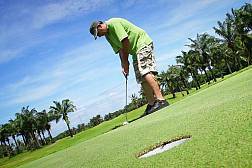 Siam Country Club Golf Course is the most well known and desirable in Pattaya. Known for hosting LPGA tournaments and with two courses - The Plantation, and The Old Course, if you are a keen golfer, this will be the experience of a lifetime. 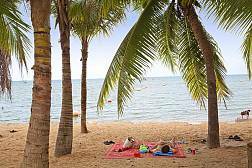 Jomtien Beach has long been known as one of Pattaya's most laidback beaches in stark contrast to other beaches in Pattaya. 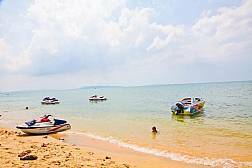 If you are seeking a nice stretch of sand away from the chaos in Pattaya, make that trek to Jomtien. 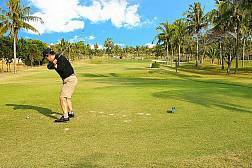 Plutaluang Thai Navy Golf Club is one of those very affordable golf courses that is popular with visitors to Pattaya. Located near to Rayong, this interesting course is probably best known for its 'Lighthouse Hole'. 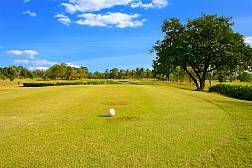 Phoenix Golf and Country Club is located at Huay Yai, just a 20-minute drive from Pattaya. 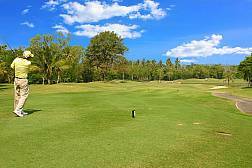 This beautiful tree-lined course is popular with Pattaya holidaymakers and locals alike. 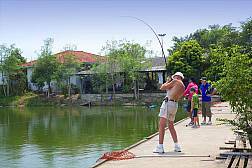 If you are seeking a laidback and stress-free fishing experience, Pattaya Fishing Park is the place to get away for a few hours' relaxation. With all the equipment available for rent, you have everything you need. Protecting endangered species and Planet Earth in general should always be at the top of our list. 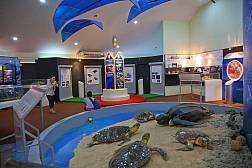 The Pattaya Sea Turtle Conservation Center is the perfect place to visit for those interested in preserving the local marine life. Pattaya Beach is the busiest beach in the whole region. 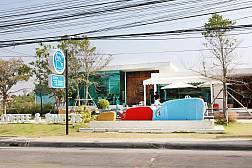 Located on Beach Road in Pattaya, there is always something going on here. 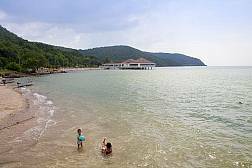 Wongamat Beach at Naklua is in a great location but is tucked away, and you will only find it if you are in the know. Surrounded by some of the best new developments, this beach is for those who are tired with the hassle at Pattaya Beach Road. 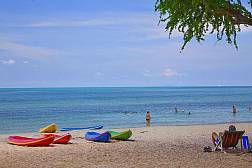 Bang Sarae Beach is one of the most beautiful beaches in the region. Located a 20-minute drive from Pattaya, this is as close as it gets to the beauty of Phuket beaches in this part of Thailand. 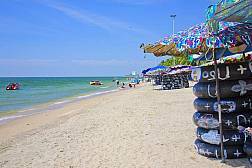 Bangsaen Beach is near Sriracha and a 1-hour drive from Pattaya. The beach is always exciting as there is always something going on. 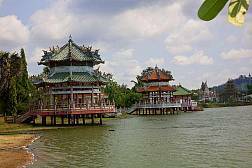 A visit to Bangsaen makes for a great day trip. 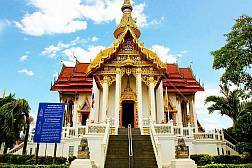 Viharnra Sien Chinese Temple in Pattaya is situated near Bang Sare and Silverlake Vineyard about a 20-minute drive outside Pattaya. The temple is astounding and inside is like a museum with hundreds of Chinese sculptures. It really is a great day's fun. 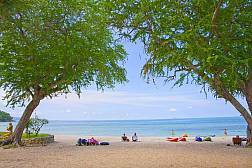 Sai Kaew Beach at Sattahip is more popularly known as the Royal Thai Navy Beach. 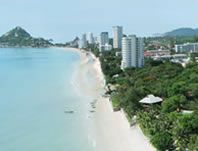 Like all these beaches from Na Jomtien to Rayong, it is very beautiful and more resembles Phuket than Pattaya. 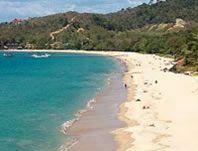 Nang Rum Beach at Sattahip is a beach taken care of by the Royal Thai Navy, and because of this, the beach is beautiful and clean, definitely worth a visit. 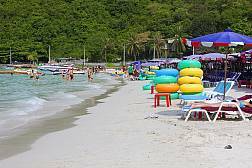 If you are seeking out a peaceful and laidback beach, Dongtan Beach at Sattahip is a place where you can take the wife and kids and relax away from the tourists. 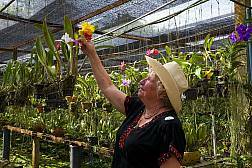 Thailand is famous for its orchids, and if you like flowers, an hour or two at Siriporn Orchid Farm Pattaya will be just the ticket. 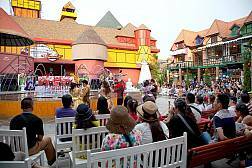 Sriracha Tiger Zoo Pattaya is the ideal place for a day of family fun while on holiday in Pattaya. 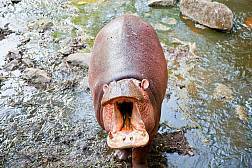 There are many different animals at the zoo and every tour desk in the region can easily book you a visit. Tiffany's Cabaret Show in Pattaya is one of the most famous Ladyboy shows in Thailand. 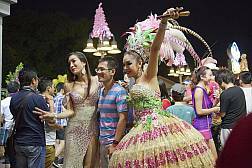 If you want to see an extravagant show from Thailand's third gender, it will be a night you will never forget. 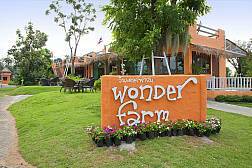 Wonder Farm is located near Bang Sare in South Pattaya and is the ideal place for family excursions. 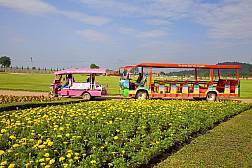 Because it's located close to Silverlake Vineyard and Bang Sare Beach, you can visit the farm as part of a day tour around the area. Ladyboy shows in Thailand are very popular with tourists, and the Pattaya Alcazar Cabaret Show has long been a favorite. This is one cabaret extravaganza that you will not forget in a hurry! 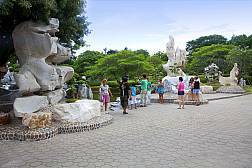 Million Year Stone Park has become one of Pattaya's best loved family attractions over the years with lots of crocodile shows and a zoo-type environment. Popular with visitors of all ages, this ia a must-visit attraction for families. 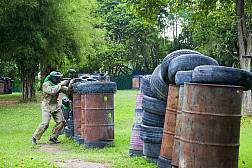 Paintball Park Pattaya is the best place to have some paintball fun when on your Pattaya Holiday. 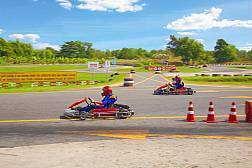 Whether with a group of friends or the family, this is some of the best fun imaginable. If you are seeking out the best architectural masterpieces in Pattaya, then you must visit Baan Sukhawadee. 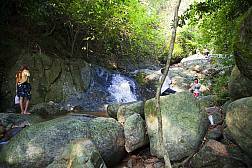 Pattaya is not very famous for its water features, but at The Nam Tok Chan Ta Then waterfall, you will find the best waterfall in the Pattaya region. This is a great afternoon's fun for the family. 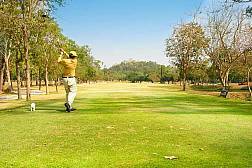 Mountain Shadow Golf Club is one of the best value-for-money golf courses in the Pattaya region. Play a round here and you won't be disappointed. 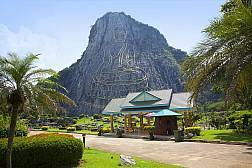 The Buddha Mountain, also known as Khao Chi Chan is located outside of Pattaya near to Sattahip and Bang Sare, within close proximity of Silverlake Vineyard and is one of the region's most visited attractions. 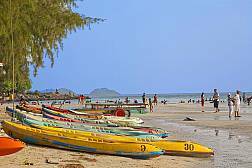 Located at Sattahip just outside Pattaya, Nang Rum Beach is one of the most beautiful and cleanest beaches in the Pattaya region. 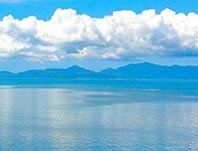 For the best views of Pattaya and the Gulf of Siam, venture out to the Pattaya Hill Viewpoint... and don't forget to take your camera. 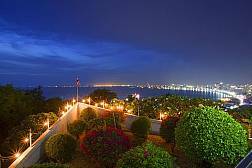 Pratumnak Hill is an upscale area located directly between Pattaya Beach and Jomtien Beach with a beautiful elevated viewpoint. With great views overlooking the sea and lots of bars and restaurants, this is a popular holiday area. Simply one of the most beautiful beaches in the region, located at Sattahip and managed by the Thai Navy. 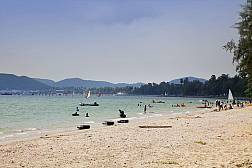 If you seek a Phuket-style beach for an afternoon of relaxation, Sai Kaew is a great choice. 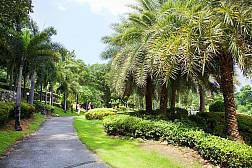 If you like a multi-purpose facility that is a garden, park and fitness area rolled into one, then Suan Chalermprakiat in Pattaya is ideal for you. 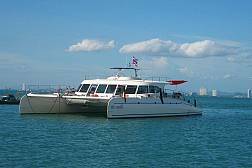 Pattaya Boat Charter offers what travelers to Thailand are thirsting for - a luxury experience far away from the crowds with uninhabited islands and the sparkling ocean as the backdrop. 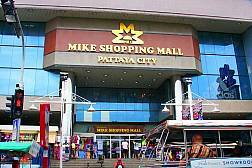 One of the oldest and most popular shopping centers in Pattaya, Mike's Shopping Mall is located on Pattaya Beach Road between Walking Street and Central Festival. From sporting goods to handicrafts and food courts, Mike's has it all. Royal Garden Plaza is one of the most popular and most established shopping centers in Pattaya with a wide range of shopping options. Popular with tourists, during a shopping spree in Pattaya, you must visit the plaza for the best choices and prices in the city. 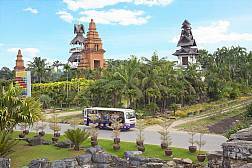 Three Kingdoms Park in Pattaya was created to showcase the beautiful features of Chinese and Buddhist culture. If you are a culture lover and want to learn more about the region's religion and past, this is the place for you. 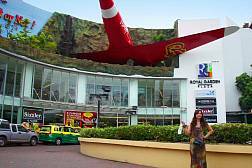 If you are on a family holiday in Pattaya, a visit to the world-famous franchise, Ripley's Believe It or Not, will be one of the best family-friendly trips during your Thailand vacation. 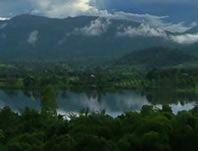 Located at the summit of Pratumnak, Big Buddha Hill is a must visit attraction for holidaymakers. Some of the views looking out across the Gulf are breathtaking. 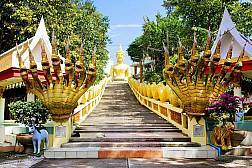 Known as one of the most sacred Buddhist Temple complexes in and around Pattaya, Wat Yansangwararam is a must visit for culture lovers. Coffee & Sweets, set in the middle of Jomtien Beach, features designer drinks, a full menu including all-day breakfast, and stellar sea views. It’s the perfect place to sip coffee and tap into free Wi-Fi while enjoying the sea breezes. Colosseum is an extravagant, new ladyboy cabaret show in Pattaya. With Broadway-style musical numbers and top-quality production values, the revue is sure to delight all ages. 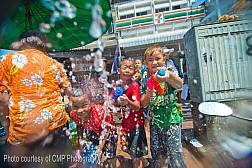 Songkran, or Thai New Year, started as a gentle Buddhist celebration of renewal and cleansing, and how grown into a countrywide days-long water fight. We give you insider tips about the best places to celebrate. 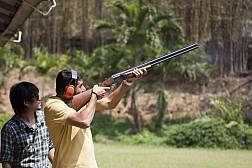 Located in Jomtien/Huay Yai just south of Pattaya, Pattaya Park Shooting & Adventure delivers fun for all ages with zip lines, climbing, fishing, and , of course, shooting and archery. 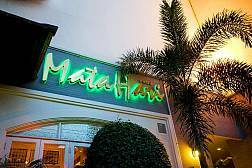 Mata Hari is a legendary Pattaya restaurant serving superb European and Thai cuisine. It has luxurious, comfortable surroundings and friendly staff to make your evening’s dining experience one to remember. 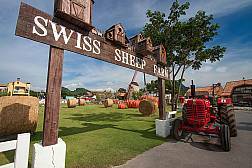 Pattaya Sheep Farm is a ‘must visit’ if you have kids with you on your visit to Pattaya. This sprawling attraction offers fun and photos galore. There are lots of activities as well as animals to get close and friendly with. For the adventurous diners amongst you, Som Tum, which is a hot and sour Papaya salad with fresh prawns must be tried, and when in Pattaya there is no better Som Tum experience than at Som Tum Pa Mon. 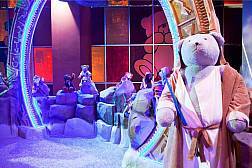 The Teddy Bear Museum is a great place for kids, and kids at heart, too. 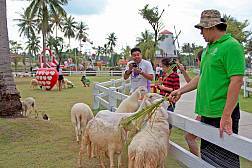 It is another of Pattaya’s ever growing number of family attractions and should keep everyone entertained. Don’t forget your camera! 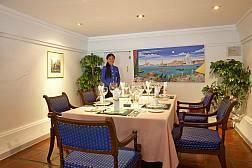 Stunning setting, stylish décor and seafood to savour. 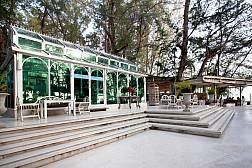 The Glass House Restaurant in Pattaya gives all three. 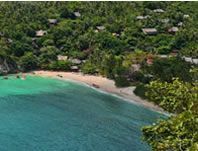 Bordering Sai Thong Beach, it serves meals to remember in the most relaxing and romantic surroundings. Mimosa Pattaya is a lifestyle mall which offers something for everyone. Shopping galore, restaurants, a romantic zone, Funland, and the wonderful Mimosa show, which takes place several times each day. The Serenity Catamaran is a beautiful 71 foot luxury vessel with 4 comfortable en-suite cabins. It is truly stunning, with international safety standards, and yours for half-, full-day, or 2-hour sunset cruises off Pattaya’s coastline. 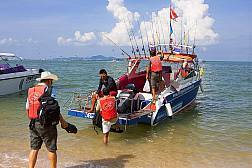 A Pattaya visit is not complete without a boat trip to some nearby islands. Take a break from the go-go-go pace of Pattaya to enjoy a daytrip – here is the most popular “3 Islands” option. 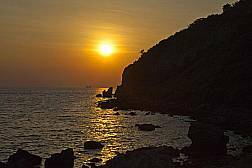 Toei Ngam Beach is located in the Thai Royal Navy Headquarters town of Sattahip. This beautiful beach is their responsibility, and the commitment they give will be very evident to all who visit. 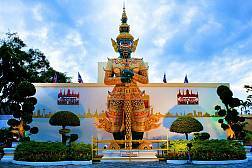 Wat Chai Mongkol is one of the most central and easily accessible temples in Pattaya. This former private monastery has been designated as a Royal temple, and is the area’s most important centres of worship. 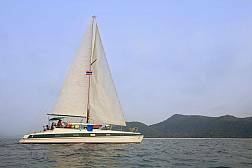 A trip on the ocean is an unforgettable way to spend some time while holidaying in Pattaya, and a trip on a catamaran such as the Manora is a perfect way to do this. 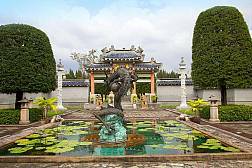 Set in beautiful gardens, Wang Sam Sien features Chinese antiques and structures that include statues and reconstructions. 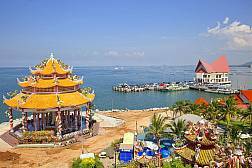 It is located close to Wat Phra Yai (The Big Buddha) in Pattaya, and the two together make a memorable daytrip. 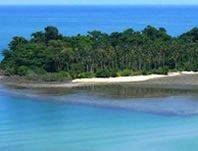 The Island and sea around Samaesarn is a hands-on study in conservation. 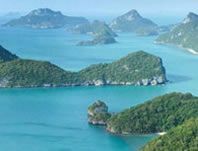 You can have a true, natural experience of real Thailand – corals, sea turtles, and rare plants – while learning at the same time. 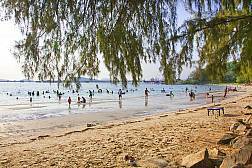 Dongtan Beach is one of the cleanest and most relax ed beaches in the Pattaya area. 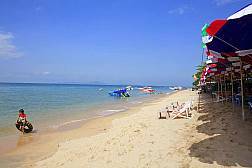 This 265 metre stretch of sand is part of Jomtien’s main beach, an d is known worldwide as a “gay beach,” welcoming to all. 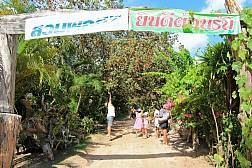 Rayong province is a major fruit growing area, and for those interested in experiencing an interesting day out, and tasting some delicious tropical fruits, a tour of the orchards is the way to go! 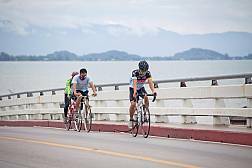 Located just east of Pattaya and Rayong, Chanthaburi is a cyclist’s paradise. With dedicated bicycle lanes, gorgeous scenery, and plentiful beaches, it’s a daytrip you’ll never forget. Are you looking for that ultimate golf holiday experience, where the planning has been done for you and you can spend one glorious week just working on your handicap and hanging out with your mates? 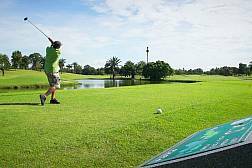 Executive Golf Tours has partnered with Thailand Holiday Homes to make your dreams a reality. 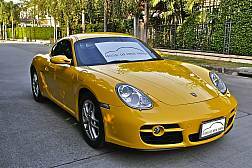 Complete your perfect Pattaya holiday by hiring a prestige car that will have heads turning and you cruising in ultimate style. Whether you choose a Porsche, BMW, or Lamborghini, you can be assured of the highest level of service and satisfaction. 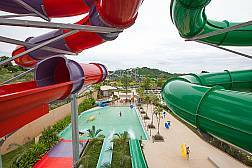 Enjoy the giant slides that you will have never ever seen before anywhere in Thailand. 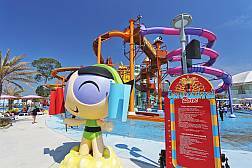 The first and only world-class water park with the world famous cartoon character theme, that every kid should not miss out on. It's only few minutes drive from Pattaya.